This chapter presents an introduction to the theory and psychometric properties of the Trait Emotional Intelligence Questionnaire (TEIQue). 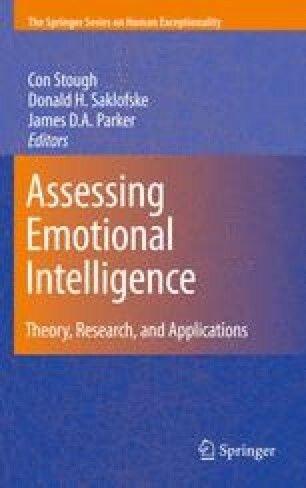 We discuss the necessity of conceptualizing the increasing number of faux intelligences as personality traits, rather than as cognitive abilities, and give a detailed description of the TEIQue as the operationalization vehicle for trait emotional intelligence (trait EI or trait emotional self-efficacy). The inventory shows adequate reliability and temporal stability at the global, factor (4), and facet (15) levels. It has a clear and replicable factor structure comprising four distinct, but interrelated, dimensions: Emotionality, Self-control, Sociability, and Well-being. Self-other TEIQue correlations are substantial and similar to those observed for the Big Five. Preliminary data are presented for the new adolescent form of the TEIQue (TEIQue-AFF), which also shows satisfactory psychometric characteristics.